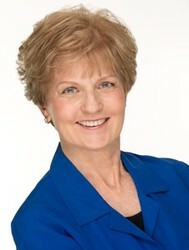 My full name is Mary Ann Roman Corrigan. I write crime stories under the name of Maya Corrigan. I owe my love of mysteries to my fourth grade teacher, who gave me her Nancy Drew collection, and to my mother, who brought home stacks of detective books from the library. Before writing crime fiction, I taught college classes in writing and literature, wrote nonfiction, and designed courses for online learners. I live outside Washington, D.C., an easy drive from Maryland’s Eastern Shore, the setting for my mystery series. When not reading and writing, I enjoy theater, tennis, trivia, cooking, and crosswords. Read an interview about my background and writing on the Virginia Center for the Book blog. I am a member of Mystery Writers of America and Sisters in Crime. I currently serve as the president of the Sisters in Crime Chesapeake Chapter. ​Maya (Mary Ann) Corrigan writes the Five-Ingredient Mysteries: By Cook or by Crook, Scam Chowder, Final Fondue, The Tell-Tale Tarte, and S’more Murders. The series, set in a historic town on Maryland’s Eastern Shore, features a café manager and her live-wire grandfather, the Codger Cook. Each book has five suspects, five clues, and Granddad’s five-ingredient recipes. Before taking up a life of crime (on the page), she taught writing, American literature, and detective fiction at Northern Virginia Community College and Georgetown University. Occasionally we read about brave people who jump onto train tracks to save someone or pull crash victims from fiery autos. Most of us will not have the chance to save a life in such a dramatic way, but we can all save a life without any cost to ourselves, as the story below illustrates. At two months of age, my grandson was diagnosed with a rare liver disease, biliary atresia, which afflicts one baby in 14,000. Only a liver transplant would save him from an early death. Fortunately, his father was a matching donor. Fifteen hours after the transplant team began excising part of my son’s liver, they finished installing “spare” parts in my six-month-old grandson, replacing his diseased liver. But even a good chunk of my son's liver was not enough. The baby also needed blood vessels from an unknown donor. That donor checked a box on his driver's license and gave away what he could no longer use. Not every child who needs a liver transplant finds a match among willing live donors. Many die while awaiting a rare pediatric donor or an adult donor whose liver can be split between a child and an adult recipient. A single organ can save two lives, but only if a generous person signs up as a donor. My grandson recently turned seven. The photo here shows him a few months after his transplant. 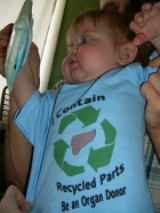 His T-shirt announces that he contains recycled parts and tells you how to save a life: Be an organ donor. If you haven’t already checked the box on your driver’s license, do it the next time you renew your license or, even better, do it now.